I don't know what the source of it was, but it is one of the more interesting puzzles that I've come across in a long time- so thanks to Gurth. 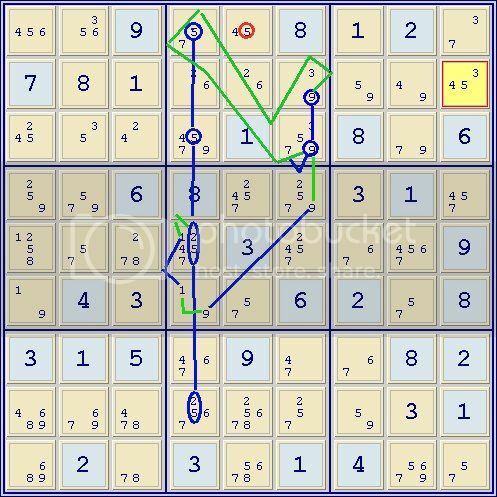 I expect to have to use nets to solve puzzles of difficulty above around ER=8.5, but below that I like to try to avoid them so this puzzle was solved with relatively simple chains: No nets (ie. AAICs/Krakens) and not even patterns (ie. empty rectangle, broken wings/guardians etc.) that often require net-like chains. It's possible that the solution could be further optimized, but I decided to stick with the first run. 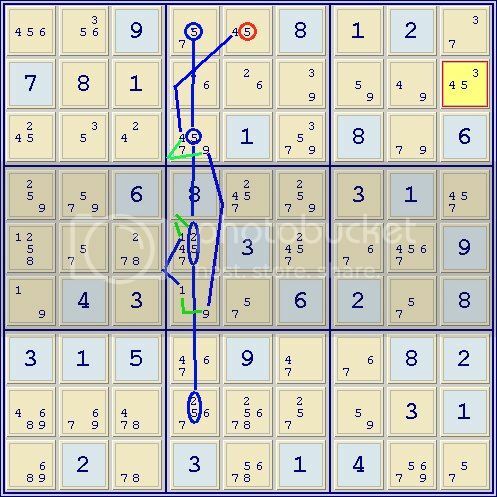 A puzzle like this doesn't die easily so each chain may lead to one or more basic methods. I prefer to show those below the numbered chain that gave rise to them rather than number them individually. Fwiw: I don't see almost-hidden sets used on this forum that much. They are very useful constructs; two of them are used here. Last edited by DonM on Wed Jan 28, 2015 6:18 pm, edited 1 time in total. Glad you enjoyed the puzzle, DonM. I should have added a name to it - basically its name is 4cp, which is just the date of composition - 4=2014, c=Dec, p=25th. (I fight redundancy on all fronts!! I wish I could remember how I made it, usually they are original, not computer generated, but sometimes I make a puzzle by letting SS or SE create a puzzle, then stripping away redundant clues. My memory is short these days. And there I was trying to solve this puzzle on one piece of paper! A rather vain hope, my picture actually looks pretty ghastly, in reducing the rating from 8.3 to 7.2. Whereas a picture like your first diagram is rather irresistible, and I enjoyed following it. I didn't follow the second pic as I thought the first one entirely adequate.